Here are the winners of some recent giveaways. What does it say about me that my favorite video game right now is LEGO Harry Potter? Oh my goodness, yes! I get sidetracked wayyyy too easily when searching the internet. LOL Thanks for the giveaway! my favorite snack or meal??? too many choices, by i would have to say favorite snack is CHIPS!! favorite meals???? spaghetti or pizza!!!! I love all westerns! Rio Bravo is one of my favs. 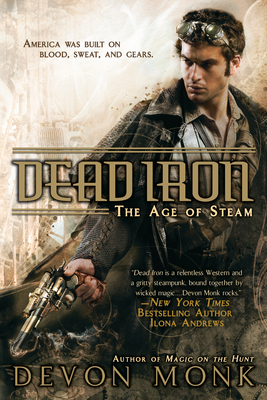 John Wayne, Dean Martin & Ricky Nelson, it had it all :-) My current favorite postapocalytic book(s) are Faith Hunter's Rogue Mage series. I'm looking forward to reading Bloodlands! The winners have been notified and have until Saturday, August 6, 2011 at 11:59PM US Eastern Time to claim their goodies or The Qwillery will very randomly choose a new winner or winners. As usual... thank you to everyone who participated! Please welcome Justin Gustainis to The Qwillery. Justin: I have a hard time getting started on a project. I put it off, agonizing the whole time, for weeks, even months. When my central nervous system finally accepts the fact that “Hey – I’ve got a book due soon!” I can go like hell. During the writing of my last book, one day I cranked out 36 fresh pages, a personal best. Mind you, I don’t say they were 36 *good* pages…. Justin: Oddly enough, most of my favorite authors are mystery/suspense/crime writers. Maybe it’s because I read a lot of that stuff before I ever read much horror or dark fantasy. That might explain why my books are considered “paranormal mysteries.” On the mystery/crime/suspense side, some of my favorites among living writers are Thomas Perry, Robert Crais, Thomas Harris, and Stephen Hunter. Some others I like, who have passed on to that Great Writers Conference in the Sky, include Robert B. Parker, John D. MacDonald, Ross Thomas, and Raymond Chandler. Among paranormal writers, I admire Stephen King (especially his money), Kim Newman, Jim Butcher, Lili Saintcrow, and Rachel Caine, among others. Justin: I try to get the broad outlines of a plot together, then work out the details and subplots as I go along. Plotting is one of the things I find hardest to do. TQ: What inspired you to write Hard Spell? TQ: What sort of research did you do for Hard Spell? Justin: Not a great deal. That’s the wonderful thing about writing paranormal fiction: you can make up anything you want, as long as you’re consistent. Although I did a little Internet work to reacquaint myself with the Scranton area (I haven’t been back in several years), if challenged I can always say, “Yeah, well , *my* Scranton is set in an alternate universe, and in that one City Hall *is* twelve stories tall and built like a medieval fortress. Or whatever. Justin: I suppose the easiest one was Detective Sergeant Stan Markowski, the protagonist. The narration is in the first person, so I suppose Stan speaks with my voice, sort of. But since Stan is supposed to be a blue collar guy, whenever he started talking like a college professor I had to go back and change things. Hardest? Probably Stan’s daughter, Christine – given the differences between us in age, gender, and, um, status. People will know what that last part means when they read the book – as well they should. Justin: Favorites would include Markowski’s first scene with his daughter, the scene set in Renfield’s, Scranton’s most popular “supe” (as in “supernatural) bar, the scene set in an adult bookstore that caters to “supe” customers, and, of course, the climactic scene, wherein the Fate of Humanity Hangs in the Balance (doesn’t it always?). Justin: I have contracts for two more. EVIL DARK will be out in January, if I ever get it written (see earlier comment about procrastination). After that, it depends on whether the publisher wants more, and whether I still have ideas. Justin: The interesting thing isn’t so much what’s next, as what’s going on simultaneously. I find myself in the odd position of having two urban fantasy novels being released on the same date (in the US, anyway): July 26th. SYMPATHY FOR THE DEVIL is the third book in the “Morris/Chastain Investigations” series. In this one, occult investigator Quincey Morris (descended from the character in DRACULA) and his partner, “white” witch Libby Chastain, learn that Senator Howard Stark, candidate for President, has been secretly possessed by a demon. Hell wants to put Stark in the White House, so that he can use the President’s powers to destroy the world. They don’t like us much, those folks in Hell. “Like the rest of America, Scranton’s got an uneasy ‘live and let unlive’ relationship with the supernatural. But when a vamp puts the bite on an unwilling victim, or some witch casts the wrong kind of spell, that’s when they call me. “My name’s Markowski. I carry a badge. See The Qwillery's 4 Qwill review here. Fraught with danger, the trail finds them stalking the mysterious occult underworlds of Boston, San Francisco, New Orleans and New York, searching out the root of the curse. After surviving a series of terrifying attempts on their lives, the two find themselves drawn inexorably towards Salem itself - and the very heart of darkness. In a story that ranges from Baghdad to Los Angeles, EVIL WAYS sees eccentric billionaire Walter Grobius attempt to unleash a devastating magical apocalypse. Quincey Morris and his partner, white witch Libby Chastain, are drawn into their deadliest case yet, but from different directions. In Los Angeles, Quincey is blackmailed by the FBI into investigating a series of ritualistic child murders. 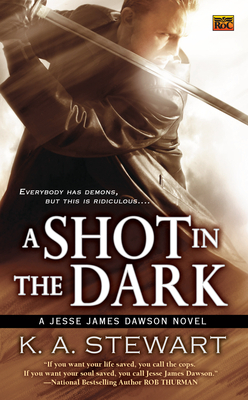 In New York, Libby barely escapes an attempt on her life by assassins armed with magical weapons. Both of these threads eventually intertwine, leading the investigators to a conspiracy so vast and diabolical as to defy belief. The final, bloody confrontation takes place at Grobius’s isolated Idaho estate, on Walpurgis Night -- the night of the Witches’ Sabbath. Quincey and Libby, and their allies, must fight a desperate battle against immensely powerful dark forces that threaten the future of all mankind. 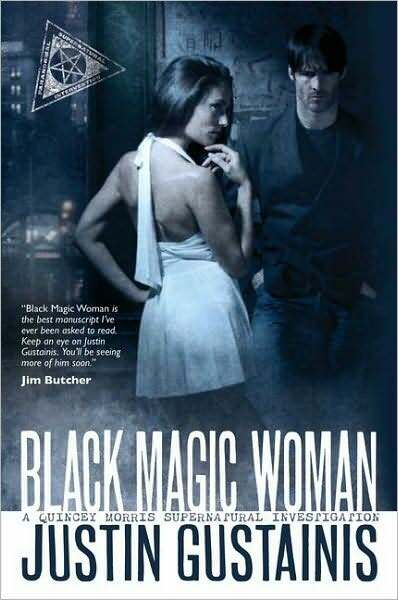 Occult investigator Quincey Morris and white witch Libby Chastain are determined to stop this evil conspiracy. But between them and Stark stand the dedicated agents of the US Secret Service – and the very forces of Hell itself. Quincey and Libby will risk everything to exorcise the demon possessing Stark. If they fail, ‘Hail to the Chief’ will become a funeral march – for all of us. Following military service, he held a variety of jobs, including speechwriter and professional bodyguard, before earning a Ph.D. at Bowling Green State University in Ohio. He was married to Patricia A. Grogan of Toledo, Ohio, from 1977 until her death in 2007. He misses her a lot. His academic publications include the book American Rhetoric and the Vietnam War, published in 1993, and a number of scholarly articles that hardly anybody has ever read. In the Summer of 2008, he attended the Odyssey Writing Workshop. What: One commenter will win a signed copy of Hard Spell (An Occult Crimes Unit Investigation 1) from Justin. What is your favorite city or town used as a setting for an Urban Fantasy? Who and When: The contest is open to all humans on the planet earth with a mailing address. 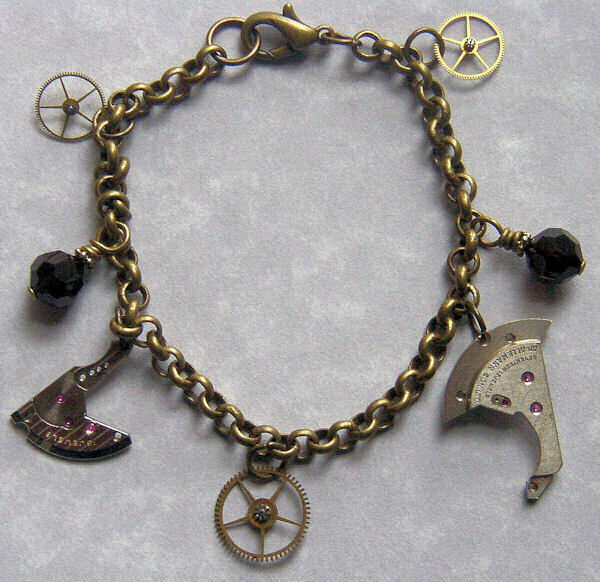 Contest ends at 11:59pm US Eastern Time on Friday, August 5, 2011. Void where prohibited by law. The Qwillery is pleased to announce that Paul Lewis has joined the 2011 Debut Author Challenge. Paul's debut, The Savage Knight, will be published in September by Abaddon Books. Sir Dodinal the Savage is more at home in the wild forest than in the tilting yard or the banquet hall. Keenly attuned to the natural world, but burdened with a terrible rage, he turns his back on Camelot to find peace, or a just death. Look for an interview with Paul in September 2011. You can keep up to date on 2011 Debut Author Challenge happenings on the 2011 DAC page. Please welcome Seressia Glass to The Qwillery. Seressia: The biggest one that I’m working on now is that it is easier for me to write at my desk at work during lunch and after hours than it is to come home and get stuff done. I definitely need to get a handle on that! Seressia: Hhm, I read so many different genres and subgenres that it’s hard to name a favorites. Looking at one of my bookshelves, I have Butler, Eddings, McCaffrey, Asimov, Lackey, LeGuin, Rowling, Zelazny, Stephen King, Jayne Ann Krentz, Ilona Andrews. As far as influences, I’ve never really thought about it. I can’t say that I have someone that I look to as a standard I want to achieve because my tastes and the state of writing are too diverse. Seressia: I’m a pantser with delusions of plotting. Actually I plot to become a plotter, but it’s all in my head. TQ: Describe Shadow Fall in 140 characters or less. Seressia: SHADOW FALL: Kira has to stop Set, Ammit and the Book of the Dead from stealing people's souls. People fight, die and leave. Chaos ensues. TQ: Without giving anything away, what is/are your favorite scene(s) in Shadow Fall? Seressia: My favorite scene is definitely when the crew goes into the Georgia World Congress Center to battle manifestations from the Egyptian Book of the Dead. TQ: In Shadow Fall, who was the most difficult character to write and why? The easiest and why? Seressia: Balm (Kira’s foster mother and head of the Gilead Commissions) was difficult to write because I go into her back story a bit and you see more of who and what she is and why. I could have gone deeper but then it wouldn’t be Kira’s story. The easiest was Myshael, the Lady of Shadows. I envisioned her as a psychotic mischievous woman-child, very frenetic and having fun in her badness. Again, could have gone more into her story but it bent my brain a bit. TQ: Who should play Kira Solomon if the Shadowchasers series was made into movies? Seressia: Kira is loosely based on Jada Pinkett-Smith’s character from Set It Off. But I think Zoe Saldana would also bring fierce intensity to the role. 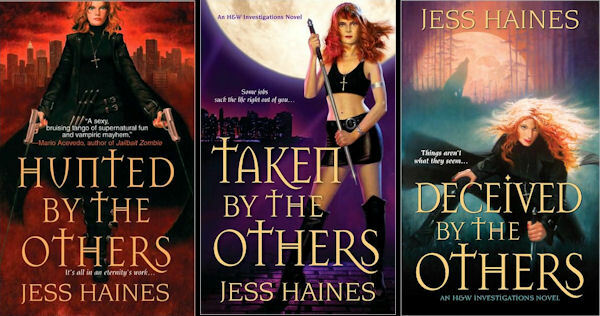 TQ: What inspired you to write the Shadowchasers series? Seressia: I’ve long been a fan of ancient Egypt, and I’ve enjoyed the African folktales that I've heard and read through the years. I’ve always wanted an opportunity to indulge my interest in African mythology, and this series allowed me to do that. TQ: Why did you set the series in Atlanta, Georgia? Seressia: Atlanta is my hometown and I just enjoy setting stories here. Plus Oakland Cemetery (on the National Register of Historic Places) and Little Five Points are just wonderfully rich places to experience. There’s a lot of history, diversity, and quirky people and places in Atlanta that I think makes the city perfect for paranormal series. TQ: What sort of research did you do to create the world of the Shadowchasers series? 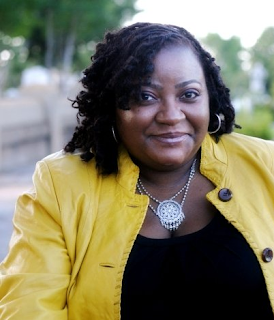 Seressia: I have quite a few books on Egyptian and African mythology and history, several visits to the Carlos Museum at Emory University to visit their Egyptian and Nubian collection, and online visits to the British Museum, Osirisnet.net, and the America Research Center in Egypt. TQ: How many books are planned for the Shadowchasers series? Seressia: At the moment, the third book will be the last. I hope to continue it in the future. Seressia: I’m continuing to develop some paranormal and contemporary romance projects and another urban fantasy project. There’s nothing slated for 2012 yet but readers can keep up with me on Facebook and Twitter or at my website. Seressia: Thank you for having me. It was a joy to be here. In a job like this, one mistake can cost you everything. As a Shadowchaser, Kira Solomon has been trained to serve the Light, dispatch the Fallen, and prevent the spread of chaos. It's a deadly job, and Kira knows the horror of spilling innocent blood. But now she has a new role, as the Hand of Ma'at, the Egyptian Goddess of Truth and Order, and an assignment that might just redeem her. A fellow Shadowchaser has gone missing, and so has a unique artifact imbued with astonishing magic. Unless the Vessel of Nun is returned, it will cause destruction beyond anything the modern world has seen. Kira's got a team at her back, including Khefar, a near-immortal Nubian warrior who's already died for her once. But as complicated as her feelings for him are, they're nothing compared to the difficulties of the task she faces.And the only way to defeat the enemy is to trust in a powershe can barely control, and put her life—and her soul—on the line. Truth is the most dangerous weapon of all . . .
Kira Solomon's life has never been simple. Battling against the Fallen, serving the Egyptian goddess Ma'at, becoming romantically involved with a 4,000-year-old Nubian warrior—these are now everyday realities. But something is changing. Kira's magic is becoming dangerously unpredictable, tainted by the Shadow she has been trained to destroy. Matters grow worse when an Atlanta museum exhibit based on the Egyptian Book of the Dead turns out to have truly sinister properties. As the body count rises, even long-trusted allies start to turn against Kira. She can hardly blame them—not when the God of Chaos is stalking her dreams and the shocking truth about her origins is finally coming to light. As one of the good guys, Kira was a force to be reckoned with. But if the only way to stop a terrifying adversary is to fight Shadow with Shadow, then she's ready to find out just how very bad she can be. . . .
What: Two commenters will each win a signed copy of Shadow Fall from Seressia. USA Mailing Addresses only. What is your favorite mythology? African? Egyption? Greek? Indian? Something else? Who and When: The contest is open to all humans on the planet earth with a USA mailing address. Contest ends at 11:59pm US Eastern Time on Wednesday, August 3, 2011. Void where prohibited by law. The Qwillery is pleased to announce that Patricia Eimer has joined the 2011 Debut Author Challenge. 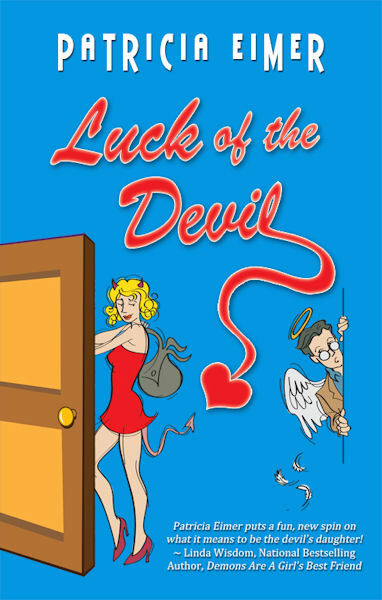 Patricia's debut, Luck of the Devil (Speak of the Devil 1), will be published by Entangled Publishing in August. Look for an interview with Patricia in August 2011. You can keep up to date on 2011 Debut Author Challenge happenings on the 2011 DAC page. I just noticed that I have 500 Followers via Google Friend Connect (GFC). I've no idea when that happened. To thank the 500 of you, I'll give one of you a hardcover copy of Ghost Story (Dresden Files 13) by Jim Butcher. So this giveaway is limited to those of you following The Qwillery via GFC. 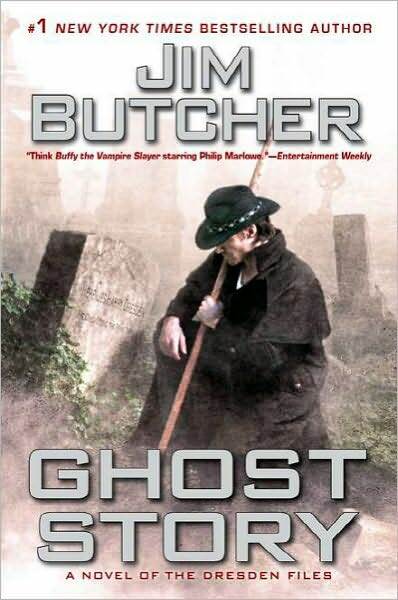 What: One commenter will win a hardcover copy of Ghost Story by Jim Butcher. How: Leave a comment that also includes your GFC follower name and a way to contact you. Who and When: The contest is open to all humans on the planet earth who follow The Qwillery via Google Friends Connect. Contest ends at 11:59pm US Eastern Time on Tuesday, August 2, 2011. Void where prohibited by law. Review copy: Provided by the author. I also bought the e-book since it was released ahead of the Mass Market Paperback. Stan Markowski is a Detective Sergeant on the Scranton PD's Supernatural Crimes Investigation Unit. Like the rest of America, Scranton's got an uneasy 'live and let unlive' relationship with the supernatural. But when a vamp puts the bite on an unwilling victim, or some witch casts the wrong kind of spell, that's when they call Markowski. He carries a badge. Also, a crucifix, some wooden stakes, a big vial of holy water, and a 9mm Beretta loaded with silver bullets. Hard Spell is the first book in the Occult Crimes Unit Investigations series by Justin Gustainis. 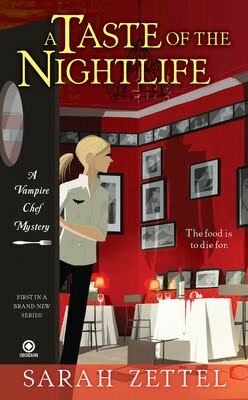 I've read a lot of books recently that include some sort of supernatural crime investigation unit - either with humans policing supernaturals, with supernaturals as police/law enforcement or both. I have not read anything quite like this. While I am not an expert on noir, Hard Spell is definitely noirish. Stan Markowski, the main character, is fairly hard-boiled, he's got an air of desperation about him for a variety of reasons which become clear in the novel. The novel also pays homage in its way to Dragnet (a police procedural radio then TV show starring Jack Webb). I loved this element in the book. Essentially, however, this is an Urban Fantasy police procedural with noir elements. 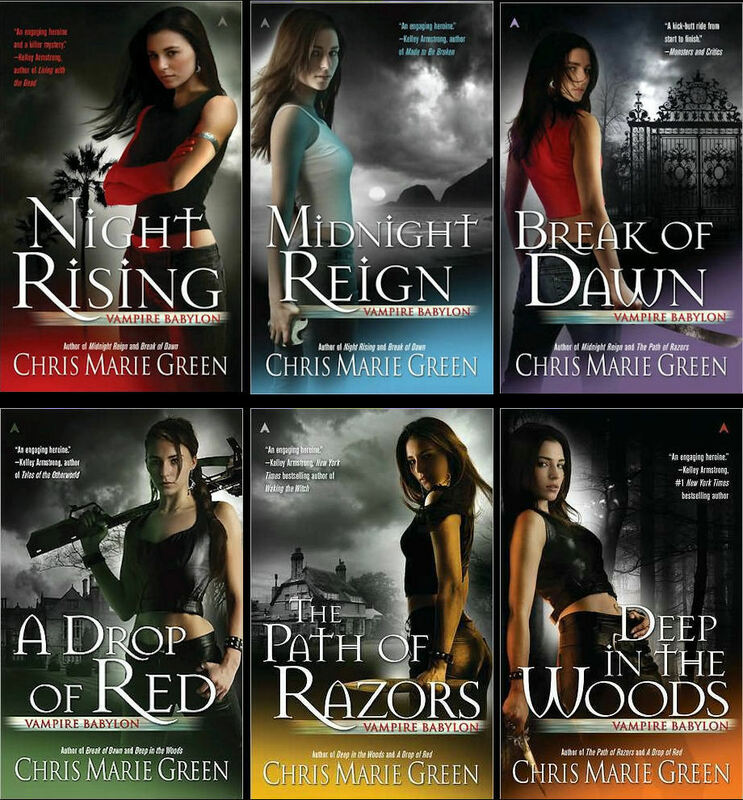 And it's a very good Urban Fantasy. 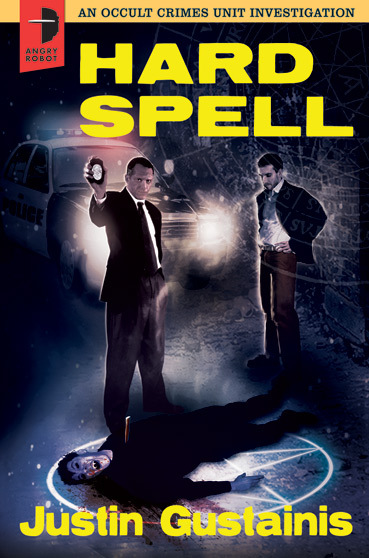 Hard Spell is set in an alternate Scranton, Pennsylvania, which I believe is a first. I learned some things from the book: Scranton is in an area of Pennsylvania called the Wyoming Valley. I also learned some slang indigenous to that area. Learning new things is always a plus for me in a book. I like the main character Stan Markowski a lot. The story is told from his point of view. He's not a typical hero by any means. He's is a good cop though he stretches the rules here and there. His partner, Karl Renfer, makes a perfect foil for Stan. Stan and Karl work for the Occult and Supernatural Crimes Investigation Unit, which is nicknamed the "SupeSquad." The police procedural elements are well done. You can tall that Mr. Gustainis did his homework, but he does not bog down the book with too many procedural details. I really like some of the secondary characters in the book, even some of the creepy and scary ones. The SWAT team is really great. Read the book to find out what SWAT means in this instance. This is a fast moving book with terrific pacing. Stan and Karl deal with several crimes while also trying to figure out the big mystery surrounding some interrelated crimes. The book moves towards the ultimate showdown while skillfully weaving together several intersecting plot lines. The ending surprised me a bit, but in a good way. The language can be a bit coarse at times, but it suits the tone of the book. There are some moments that made me laugh and/or smile. For example, you reach the SupeSquad by dialing "666." That actually makes a lot of sense. This is a very good start to a new series, and I'm looking forward to the next book. I give Hard Spell 4 Qwills. Please welcome Will McIntosh to The Qwillery as part of the 2011 Debut Author Challenge interviews. Will's debut, Soft Apocalypse, was published in April 2011. Will: I write lying down. I’m stretched on either a couch or bed, propped with pillows. I can write sitting up, but I’m not comfortable that way. Will: More of a pantser. Until a few years ago, when I was writing short stories exclusively, I was a total pantser. I still have plenty of short stories that I’ve never finished because I got stuck at some point with no idea how to continue. With novels, I’m closer to the middle. Large sections of the story are complete blank spaces when I start writing, but I like to have some idea what the beginning, middle, and end will look like so I know I’m not going to work on it for six months then realize it’s not going to work. The stakes are so high with novels; to just jump in and have faith that I’ll figure out the story as I go is unnerving. The problem I struggle with is often I just can’t figure out what should happen until I’m actually writing. Often I have to be immersed in the story to see the characters clearly. I’m working on my third novel right now, and the entire last 1/3 is pretty much unknown at this point. I’m not thrilled about that, but it’s just not revealing itself yet. Will: Robert Reed, Vonda McIntyre, Kim Stanley Robinson, Dan Simmons, Stephen King, Richard Russo, Pat Conroy, Nick Hornby, Michael Chabon, Johnathan Lethem. I think Stephen King has had a big influence on my writing, because I’ve been reading him since I was a kid, so his influence has permeated all the different periods of my life. The most direct influence on my writing has been the writers who served as my teachers, first at Clarion, then at Taos Toolbox: James Patrick Kelly, Kelly Link, Walter John Williams, Maureen McHugh, Nalo Hopkinson, Richard Paul Russo, Howard Waldrop. I’m so grateful to them for the guidance and insights they gave me. TQ: Describe Soft Apocalypse in 140 characters or less. Will: Civilization slowly collapses. People cling to the lives they used to live and try not to notice. Terrible things happen to them. TQ: What inspired you to write Soft Apocalypse? Will: Reading the news each day. There is such an astonishing disconnect between what scientists are saying about the dangers facing us, and our response to their warnings. I wondered how people who are totally unprepared for a true collapse, who have no skill with weapons, don’t know how to cure meats, and would go into a deep depression without television and the Internet (people like me) would respond. For the core of the story, I wanted a character who is clinging to some aspect of our world that would seem out of place during the collapse of civilization, something that would underscore his denial of what was really happening. I made it a guy who’s worried about his love life--sort of if Rob Gordon from Nick Hornby’s High Fidelity was working out his relationship issues while having to step over corpses. TQ: What sort of research did you do to create the world in the novel? Will: My father, a retired Brigadier General who also worked for the New York State Emergency Management Organization, helped me quite a bit with military and emergency response technical details. The collapse itself was based to some extent on James Howard Kunstler’s book, The Long Emergency, along with tons of articles I’ve read on overpopulation, peak oil, global warming in recent years. TQ: Without giving anything away, what is/are your favorite scene(s) in Soft Apocalypse? Will: Some of my favorite scenes are the ones that readers either love or hate. There’s the art gallery scene, where Jasper is swept up with innocent gallery-goers who are executed by Dada terrorists. When it’s his turn the terrorists see that he’s not from that upscale part of town and they let him go, but only after forcing him to do something horrifying and humiliating that haunts him throughout the rest of the novel. The Wal-Mart scene is another of my favorites. Jasper’s date, Deirdre, incites a riot over price-hikes by throwing fruit at a manager. The riot escalates, and by the time it’s over, Savannah, Georgia’s Wal Mart is permanently closed. TQ: In Soft Apocalypse, who was the most difficult character to write and why? The easiest and why? Will: Deirdre, the personality-disordered singer was probably the most difficult. She was the most extreme character--angry, bitter, lacking a core sense of self--so I was often afraid I was letting her spin out of control into a cliché of the Bad Girl. (My wife, for example, thought there were too many instances where Deirdre exposes her breasts, so some of those had to go in the final draft). The easiest character was Cortez, because I understood what made him tick. He was a tough but insecure guy, the only central character who pretty quickly grasped the new reality they were living in and figured out how to survive, even thrive, in it. When things get truly awful the other characters have to lean heavily on him because they don’t know what the hell to do, because they’ve been clinging to their cell phones and deodorant while he’s been learning how to make jerky out of squirrel meat. Will: My second novel, Hitchers, will be published by Night Shade in early 2012. It’s about a cartoonist who becomes possessed by his dead alcoholic Grandfather. He has plenty of company, because a half million others in his city have also become possessed, including an aging rock star and a woman who may be possessed by the cartoonists’ one true love. The cartoonist is in a race against time to figure out how to evict his grandfather before Grandpa manages to push him out of his own body and into the land of the dead. I’m at work on my third novel, Faller, and I’m co-writing a Sci Fi thriller screenplay with Ted Kosmatka. Will: Thanks for having me! 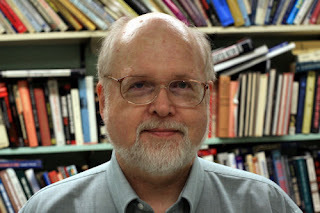 Will McIntosh is a Hugo award winner and Nebula finalist whose short stories have appeared in such venues as Asimov’s (where he won the 2010 Reader's Award for short story), Strange Horizons, and Science Fiction and Fantasy: Best of the Year. 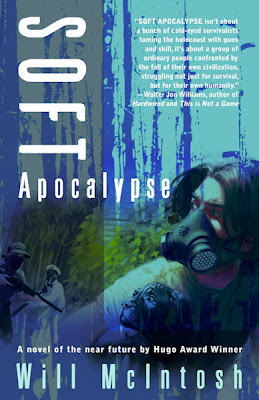 His first novel, Soft Apocalypse, was released in April from Night Shade Books. It is based on his 2005 short story of the same name, which was nominated for both the British Science Fiction Association and the British Fantasy Society awards. His story “Followed,” which was published in the anthology The Living Dead, has recently been produced as a short film. Will is a psychology professor at Georgia Southern University; in 2008 he became the father of twins. What: Two commenters will each win an e-book of Soft Apocalypse generously provided by Night Shade Books. Who and When: The contest is open to all humans on the planet earth with a mailing address. Contest ends at 11:59pm US Eastern Time on Tuesday, August 2, 2011. Void where prohibited by law. Justin Gustainis, author of the Morris and Chastain Investigations series and the new Occult Crimes Unit Investigation series. Hard Spell, the 1st book in new series is out tomorrow as is Sympathy for the Devil, the 3rd Morris and Chastain novel. A book shopping list in PDF format may be found by clicking here. Click "File" on the left and then "Print (PDF)." Remember to set your printer to Landscape mode. Anthology covers and book trailers are below. Here is my list of books coming out in August 2011. If there is something that I've missed, please leave a comment below. Any genre mistakes are mine. Leave a comment if you feel that the genre is wrong. Also note that this list is always under revision. Please note that publication dates change. I try to keep this as accurate as possible. Anthology covers are below. Please note that I am no longer including YA books in the release lists. YA is not the main focus of The Qwillery, and I rarely read YA. Having said that I may from time to time include a YA book in the lists. I've also changed the way I mark books as debuts, reissues, trade to mass market, etc. See the new key to the abbreviations below. The Urban Fantasy Anthology Beagle, Peter S.